Cypress Creek Watershed Protection Plan aims to ensure that the long-term integrity and sustainability of the Cypress Creek watershed is preserved and that water quality standards are maintained for present and future generations. After an inquiry from Hays County, Buda City Council unanimously approved a resolution on March 26 opposing the Permian Highway Pipeline and asking the legislature to take action. Similar resolutions have been passed by the cities of Woodcreek, Wimberley, Kyle and San Marcos as well as by Hays County. Most Texans don’t worry about being left behind without access to clean, affordable drinking water – after all, it never fails to fill our sinks, showers and hoses. But in a growing, drought-prone state that is ground zero for climate change, making sure that we’ll always continue to have fresh water for all is a concern that we at the Texas Living Waters Project wrestle with daily. BLANCO, Texas — Homeowners near the Blanco River say there's an algae problem that's damaging the quality of the river, and it's gotten a lot worse in just a few weeks. The Texas Senate on Wednesday unanimously approved a bipartisan package of bills that would pull $1.8 billion from the state's rainy day fund to aid in Hurricane Harvey recovery and plan for and protect against future storms. Citizen complaints have been filed with the District Attorney’s (DA) office after the city of Wimberley failed to post a notice of possible quorum prior to a Feb. 25 Texas Water Development Board (TWDB) meeting that four city council members attended. The San Marcos City Council chamber was full of members of the community on Tuesday, March 5, as the council considered a resolution opposing the proposed route of the Kinder Morgan Permian Highway Pipeline through Hays County. The Meadows Center invites young leaders, ages 18 to 29, who are passionate about ensuring equitable access to nature to register for a free Natural Leaders Summit on March 30-31 in San Marcos. 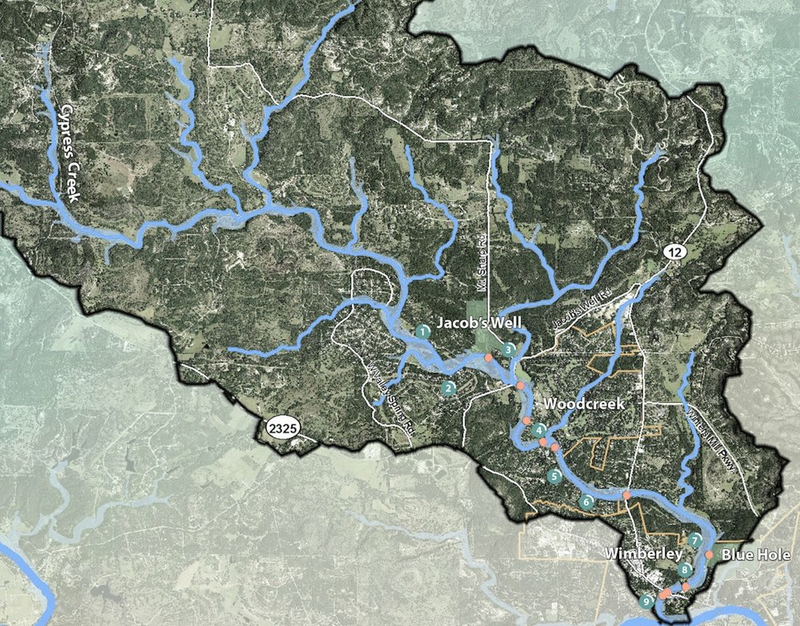 Postponement of a Texas Water Development Board (TWDB) decision on Wimberley’s proposed change of scope for its wastewater project now places those plans in limbo. Overgrown or unwanted pet fish often end up in the nearest waterway, but in San Marcos, local officials are working to make sure that doesn’t happen with a special pond for those that don’t have an aquarium to call home. The Texas Commission on Environmental Quality revealed the winners of the prestigious Texas Environmental Excellence Awards. Governor Greg Abbott and TCEQ commissioners jointly selected the ten winners (which included the Texas Stream Team) —based on recommendations from a Blue-Ribbon Committee—in nine categories. In anticipation of significant population growth over the next decades, several years ago Buda officials began to look seriously at how to ensure a reliable water supply. Kyle-area residents packed Wallace Middle School to press Kinder Morgan on the company’s proposed 430-mile underground natural gas pipeline. But the open house, hosted by Kinder Morgan officials, left some residents with more questions than answers. One week after Hays County Commissions voted to support House Bill 1303, Dripping Springs City Council on Feb. 19 followed suit, passing a resolution of support of their own. House Bill 1303 would restrict the presence of billboards along certain roads in Hays County. Though it may feel like this winter is going to go on forever, fear not, as spring flowers are well on their way. Especially in the state of Texas. According to Wide Open Country, Texas Hill Country — a region located at the nexus of west, central, and south Texas — could see its greatest flower bloom in a decade.